Although Microsoft has announced that it will stop supporting Windows 10 Mobile after December 2019, the company has released the tools required to unlock its Windows Phones and run other operating systems on it. Even though Microsoft’s handsets failed to gain the traction the company was hoping they would get, they did amass their own following and some of its users still continue to play with the device. Recently, a user tried running Windows 10 ARM on one of these devices and the results were rather interesting. The YouTuber Wall SoGB recently uploaded a video which shows the Lumia 950 XL running Windows 10 on ARM. The developer was also able to play the original Fallout game on the device after altering its software. To refresh your memory, the Lumia 950 XL is fueled by the Snapdragon 810 SoC and only has 3GB of RAM. However, even with that configuration, the phone was able to run Windows 10 on ARM with very few lags, even though the platform was designed to run on the Snapdragon 835 chipset. 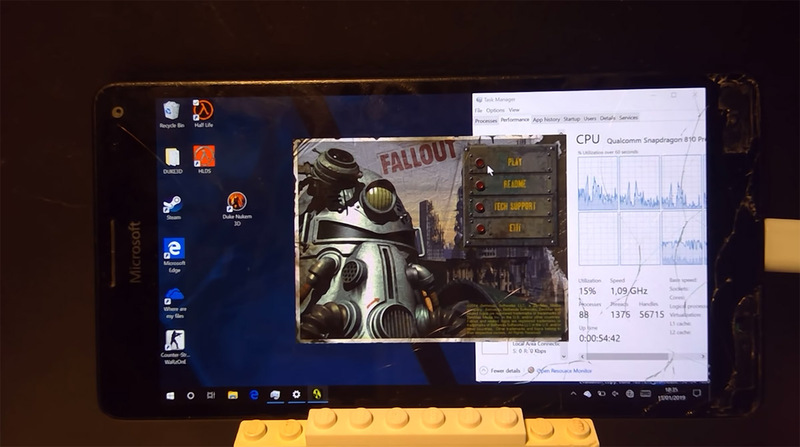 The game was played through Steam but since neither Fallout nor Steam is natively supported on the ARM CPU architecture, the hacker used Windows on ARM’s x86 emulation to play the game. Considering the fact that Wall SoGB was able to play a desktop game on a phone without a virtual machine, it is very impressive and also indicative of the untapped potential of Windows Phones that Microsoft decided to ax, whatever the reasoning might have been. Currently, Microsoft is concentrating all its smartphone efforts on Android and iOS but there might be some hope when it comes to a product that’s closer to the form factor of a smartphone. The rumored and highly-anticipated Surface Phone project in reportedly in the works. However, some believe that the Surface Phone has now evolved into the alleged Surface Andromeda device, which would be a hybrid, dual-screen device that would be able to run Windows 10.